The Twin in Berlin: I Totally Scored Getting Here At This Time!!! What A Blessing! I Totally Scored Getting Here At This Time!!! What A Blessing! I am sitting in a little internet next to Sister Norton typing as fast as my little fingers can go. HAPPY BIRTHDAY MOMMMMAMAA!! I realized right after I sent my short email wed morning that you guys were probs out celebrating at that time. I was so out of it hahahaha. But I missed going to get cheesecake or something with you momma, I LOVE YOU!! You are beautiful and kind and always put others before you, how great of an example you are to me. I’ll have to send you a letter to do this great celebration justice. I have SO MUCH to say, so hopefully we can get through all of this in a half hour. Did you know that the daily planners only last a transfer??? hahaha I do not know that but I thought they lasted for like ever.... Embarrassing! Also did you know that we talk to our district leaders EVERY NIGHT?? hahaha that too is very new and also a little embarrassing. So I’ll give some details from the MTC. It all turned out ok no worries. I could not go on the finding activities cause my temporary visa was not good for that. So I went to the temple with the other Amis, haha Americans in the German terms, instead. I went to the Preston Temple three times while there. It was beautiful and I loved it. I became good friends with an elder from Whales, who is going to the Greece Athens mission. He is so cool and nice, and gave me a Book of Mormon with a sweet note in it. haha he signed it with 'love' hahahah that caught me off guard but worry not, he is just friendly like that. Elder Davies, from Wales. Wait is there an h in there or not.... anyway. I befriended some of the other English elders and would say God save the Queen with them. That was always fun. Only one of them, Elder Heath, said he actually thought the Queen was brilliant. They all went to the Alpine Mission though, laaaame. So on Wednesday morning we woke up at 315 and left an hour later to the Manchester Airport. We were supposed to fly from Manchester to Munich, then on to Berlin. BUT our flight to Berlin was canceled, so we would have to take a 6 HOUR TRAIN RIDE instead. Meine gute!! It wasn't that bad, but actually I guess it was hahahah. We arrived in Berlin at like 730, and wandered around trying to find the APs. Nowhere in sight. An hour later after finally getting a hold of them we realized we were at the stop after where they were. Ohhh mannn. The four of us little Berliners were so tired and out of it by the time they picked us up, hahah i could not stop laughing. So since it was so late, they just drove us to the office, where we were greeted with DOMINOES PIZZA yes you read that correctly. It was ok... haha but we did paperwork, and met with President Kosak! He is soooo funny and nice. I love him!! I wish I could describe every detail of the next day but I just can't!! Awww sorry one day you'll know. So we walked into the chapel where all the trainers were there to shake hands or hug us. It was so cute and fun. 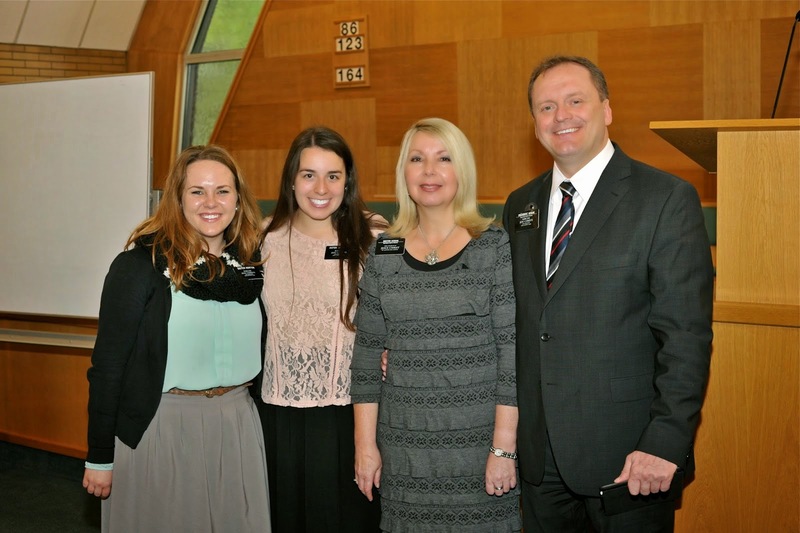 I was so excited to get paired with Sister Norton!! She is the best. So cute and funny, and makes the cutest most hilarious faces ever. We had to travel two hours to our area. tiirrreddd much? That was Thursday. 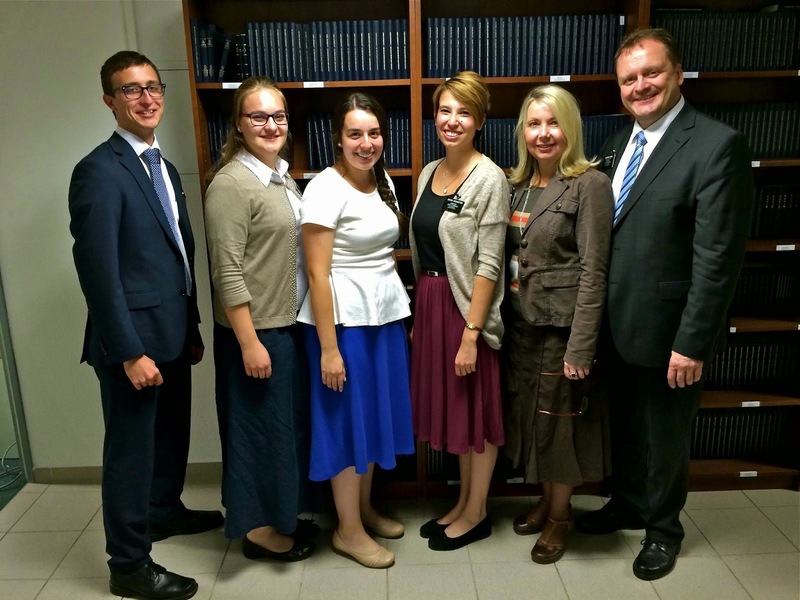 Friday afternoon we traveled back to Berlin 2 hours because.... Oh yeah, ELDER BEDNAR WAS VISITING. (On Saturday) we spent the night with some nearby sisters. I totally scored getting here at this time!!! What a blessing. Right when he walked into the room and walked past us, I just felt the most amazing feeling. It was an undescribable confirmation to me that he truly is all that I sustain him and the other Apostles to be. Wow. He really stressed the importance of learning how to grow spiritually by ourselves. Sorry I don't have more time for details. But I did get to see Elder Clarke, Meeks and Sister Knecht!!! hahah Jacob and I kept dropping each others names on accident. Oh and his cousin is actually my zone leader! Haha I got phone calls from our district leader, and the two zone leaders all on Thursday night. That was fun. 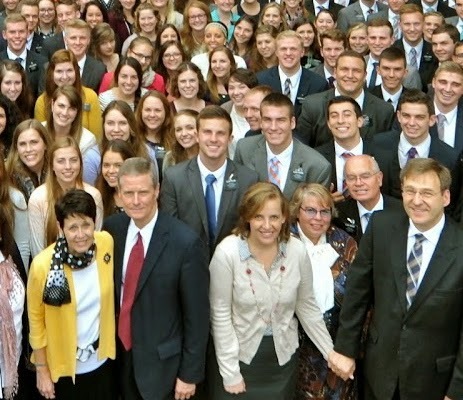 Elder & Sister Bednar with the Germany, Berlin Mission. Can you find Madison Mittleman and Jacob Clarke? It’s hard to describe how everything is, the city, the food, the work, because I have just had so much travel time. For four nights in a row I slept in four different beds. hahah what a life. Please send me all of Megan's emails when you get them, we can only send so much to each other yo. So we live in the middle of the city, no bike. Lots of train and buses. This area is huge. But pretty. It's been cloudy and rainy, but not too bad or cold actually. I have only met with 3 of our investigators, but with each of them I have really felt such LOVE for them: I just want to do all I can to help them get closer to Christ and to Heavenly Father. To feel that they have a purpose in this life, and there are things they can and should be doing to feel love and happiness. Sorry this email was a little whack, it's just been a CRAZY week.